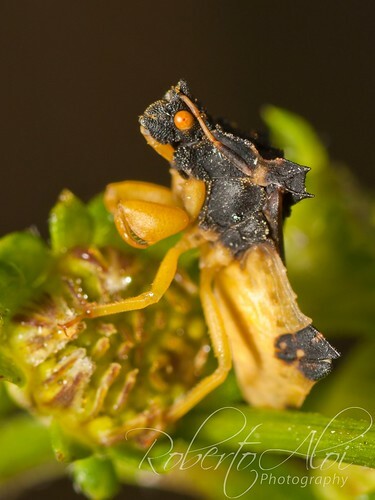 James Marshall and I stumbled upon this peculiar insect while shooting macro. I don’t know how I spotted it to be completely honest. I didn’t notice the eyes at first glance and it was extremely small. As I approached and noticed movement I realized this is something I don’t believe I have spotted in the past. Really excited about finding this bug and hope to see it again. These are predaceous insects that station themselves on flowers in brushy areas to ambush smaller insects. from Wikipedia – Armed with raptorial forelegs, ambush bugs routinely capture prey ten or more times their own size. They form a subgroup within the assassin bugs.